It’s awesome to see another great review for Pelgrane Press! 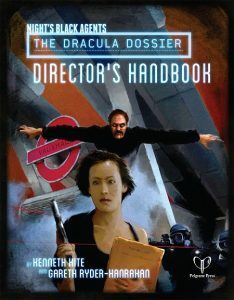 I want both books of the Dracula Dossier so badly that I (mostly figuratively) salivate just thinking about them. That I couldn’t afford to get in on the kickstarter was a real disappointment. 1. Is Dracula Redacted standard RPG size (8.5 x 11 inches I believe) or is it trade sized? Thank you again for standing at the vanguard during this new golden age of RPGs! Have a good weekend! Dracula Unredacted is standard book-size. Think of digest-format. (Sorry, but since I’m not too familiar with inch-conventions, in EU-size, it’s approximately A5, about digest-size, same format as e.g. the LotFP-prints. 2….you know…you actually get me thinking here. I actually may start a Zalozhniy/Dracula campaign…I’d certainly *love* to run this! I need to calculate time and everything else ASAP!